Pre-salt oil deposits are located offshore under deep, thick layers of rock and salt and require substantial investment to extract. The depths and pressures involved in pre-salt production present significant technical hurdles. 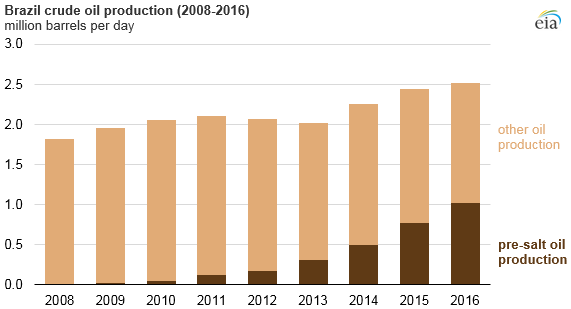 Despite these challenges, however, pre-salt crude oil production in Brazil has increased significantly since it began in 2009. Pre-salt resources were first discovered in Brazil’s offshore Santos Basin in 2005 by state-controlled Petrobras, the dominant participant in Brazil’s oil sector. Further exploration in the Santos, Campos, and Espirito Santo basins revealed an estimated 5 billion to 8 billion barrels of oil equivalent in a pre-salt zone 18,000 feet below the ocean surface. 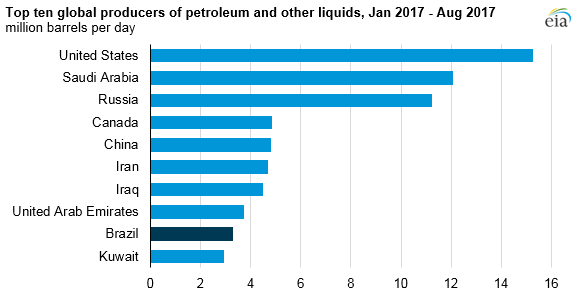 With the exception of the Libra field, all pre-salt areas currently under development were granted to Petrobras without competition. The Libra field was the first to be auctioned under Brazil's new production-sharing model, and it is operated by Petrobras (40%) as part of the international consortium whose other partners are Total (20%), Shell (20%), and Chinese national oil companies China National Offshore Oil Corporation (10%) and China National Petroleum Corporation (10%). The Libra field—the largest pre-salt oil discovery to date in the Santos Basin—began producing for the first time in November 2017. The field is located approximately 106 miles off the coast of Rio de Janeiro in water depths up to 11,500 feet. According to Brazil’s National Agency of Petroleum, Natural Gas, and Biofuels (ANP), the Libra field is estimated to hold 8 billion to 12 billion barrels of recoverable reserves. Using a floating production, storage, and offloading vessel (FPSO), early production from Libra has been about 50,000 b/d. Development of the field is expected to continue in the 2020s with the deployment of another FPSO that has a production capacity of 150,000 b/d. ANP estimates that peak production at Libra could eventually reach 1.4 million b/d. More information about Brazil’s energy sector is available in EIA’s Brazil Country Analysis Brief.